Diesel? Wait for that big fill-up! Motorists will be paying slightly less for diesel and kerosene, but a bit more for gasoline in the coming days. Effective midnight, Sunday, January 15, the retail price of diesel and kerosene will decrease, in keeping with the cost of oil on the international market. As a consequence, diesel will now be retailed at $2.77 – a decrease of eight cents; while kerosene will cost $1.79 a litre, a saving of 11 cents. 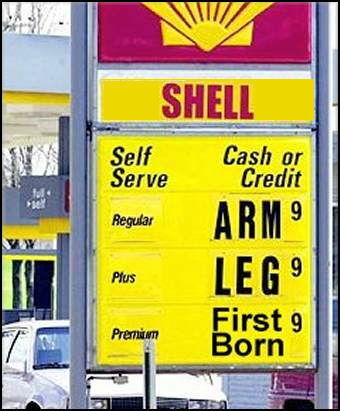 However, the price of gasoline will move from $3.07 to $3.09 per litre, an increase of a penny. Meanwhile, consumers will also have to pay more for liquefied petroleum gas (LPG). The price of the 100-pound cylinder will go up by $4.11 and will now be retailed at $200.83; while the 25-pound cylinder and the 20-pound cylinder will now cost $55.31 and $44.20; an increase of $1.84 and $1.53, respectively. The following column by Afra Raymond was spawned by events associated with two of our recent stories. On December 30, 2011, Barbados Free Press published Afra’s piece Did former T&T Finance Minister break her oath over CLICO insider trading? After it all hit the fan between The Guardian and Afra Raymond, BFP published our January 4, 2012 post: Afra Raymond resigns from Trinidad & Tobago Guardian: Paper wants politicians to preview articles. That resignation story brought T&T Guardian editor Anthony Wilson to BFP. Mr. Wilson was not a happy camper. It sure was unexpected to see a news media professional so upset by a little old blog like BFP to the point where Mr. Wilson threatened us with legal action. Hey… we’re just telling it like it happened. I guess we expected some of that “I disapprove of what you say, but I will defend to the death your right to say it” stuff from Mr. Wilson. Wuhloss! What a disappointment. Here’s Afra Raymond’s latest in the saga. Let ‘er rip, Afra! For those who are only now joining the story, this is a summary of what I feel are the vital issues here. My commentary column on the former Minister of Finance, Karen Nunez-Tesheira, was sent to her for comment by the Guardian’s Acting Editor-in-Chief, Anthony Wilson. That is a completely improper action, which is a breach of basic media ethics. When I challenged that action as being surprising and unprecedented, Wilson responded that “…It is by no means unprecedented territory…”. At which point I resigned as a Guardian columnist and this broad discussion started. Quite apart from the unnecessary legal threats, since it was never my intention to defame anyone, we are now being told that this was a one-off decision to send my entire column for vetting. Firstly – Why did Wilson seek to tell me, in relation to his decision, that “…It is by no means unprecedented territory…”? Secondly, if we accept that his reversal is now the true state of things, there is another issue. Why was this exceptional consideration shown to the former Minister of Finance? That is the ‘sole and only issue’.